I am not quite sure how I actually managed to do any work this week. I was on a roller coaster of sugar highs followed by big time crashes in a week full of baked goods. We had our monthly birthday celebration at work, and I'm lucky enough to be a taste tester for a baking endeavor (which I will most likely write about another day), but most importantly (and most fun) it was National Cupcake Week! For the past few years, my friend (and blogging guru) Rebecca has been celebrating National Cupcake Week by making cupcakes every day all based on one theme. This year's theme: Ice Cream Desserts! I asked her if I could blog about all her wonderful cupcake creations along with my thoughts and reviews! If you want to read more about the baking and inspiration behind the cupcakes, just click on their links and they will take you to the page for that day! (Her pictures are WAY better than mine so you should click through to her pages!) The descriptions below come straight from Rebecca, followed by my pictures and personal thoughts about each flavor from this week. "A soft banana flavored cake with a sweet and tangy Strawberry & Pineapple Buttercream Twist Frosting and topped with dark chocolate shavings!" The Banana Split cupcake was FULL of flavor. The icing packed a tangy strawberry and pineapple punch while the cake had a strong banana flavor. 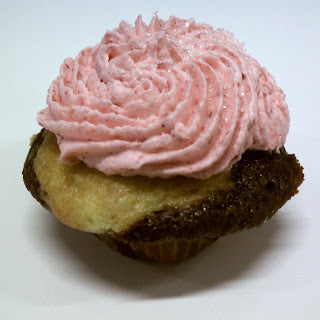 I'm not usually one for fruity desserts, but this cupcake was GREAT! And could it look any cuter? Such a perfect twist of color (and flavor) in the icing! 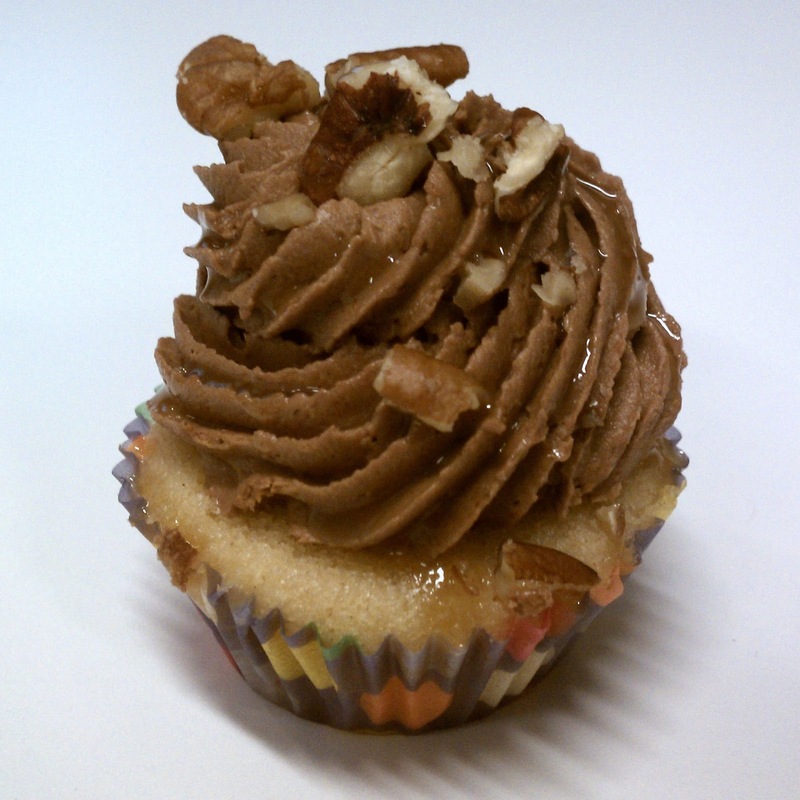 This was a strong and yummy start to National Cupcake Week! "Whirls of chocolate buttercream rest atop a salted caramel cupcake and capped off with chopped pecans and tiny twirls of caramel." The Turtle Sundae was made for me! I love chocolate. I love pecans! I love caramel! I LOVE TURTLES! Yum! This cupcake easily beat out the Banana Split for me (although like I said above I am not usually fond of fruity flavors in desserts). AMAZING! I loved the combination of flavors, especially with the caramel oozing down the sides! The chocolate icing was yummy and very sweet. My only critique: I think perhaps the amount of icing was a tiny bit overpowering for a mini cupcake because of how sweet it was. Can we TALK about this little mini squirt of caramel she put into the cupcake!?!?! The PERFECT amount. I loved the sweet surprise inside! That was definitely my favorite part! "A rich chocolate cupcake dotted with a vanilla creme center topped with a vanilla buttercream frosting speckled with tiny Oreo bits and garnished with a mini Oreo." This was hands down my favorite cupcake of the week! The chocolate cake was super moist! Rebecca even put a little surprise of cream inside! The icing was amazingly fluffy and not way to sweet at all. Very light which (I have decided with this cupcake) is a great way to represent ice cream in icing. The mini Oreo on the top was adorable and I loved that it was a tad bit soft...it reminded me of the soft/crunchy bits in the middle of ice cream cake (my favorite part). I just loved this cupcake!!! 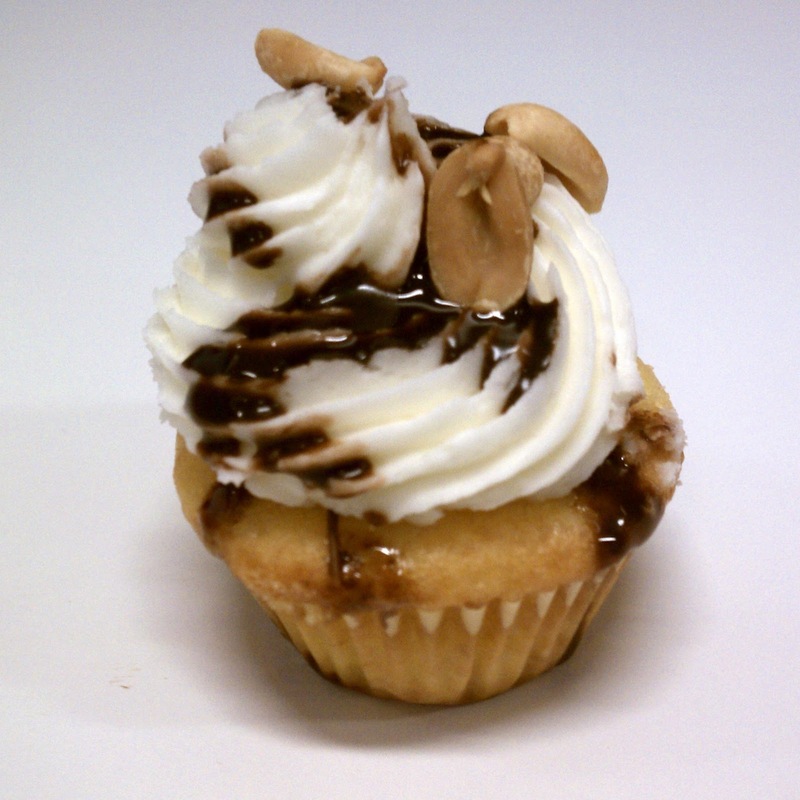 Rebecca Says: "A vanilla cupcake with a crisp milk chocolate cap and topped off with vanilla buttercream, chocolate syrup, and peanuts." What a great way to end the week! I didn't think anything could beat the Oreo icing in terms of replicating ice cream and I was right...but I think this tied. It wasn't light and fluffy...but it was extremely smooth and not too sweet. It made the perfect vanilla ice cream. 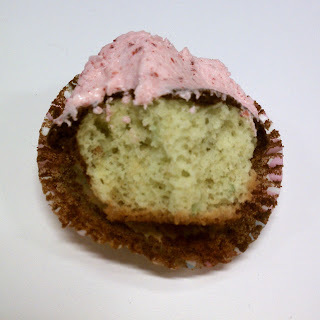 Its not visible in the picture, but there was a harder piece of chocolate between the icing and the cupcake. I liked the chocolate, but I'm thinking a soft chocolate filling like the caramel earlier in the week would have done better. The peanuts on top were the perfect finishing touch! A VERY yummy cupcake! Rebecca Says: "Layers of pistachio and chocolate cakes topped with a fluffy cloud of whipped cherry frosting." (It was also garnished with granulated sugar. 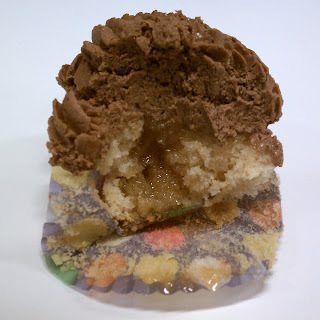 As a sidenote, I have a special connection to this cupcake). I was apprehensive about this cupcake. I like chocolate and I LOVE pistachio nuts. Cherries are alright but by now you all know I'm not a fruit dessert lover. Plus I've never had spumoni. That being said, I think the flavors in this cupcake went really well together. The cherry icing by itself was a bit strong for me but It really complimented the cake(s). The chocolate cake seemed to dominate the pistachio, but you could tell it wasn't all chocolate. I thought it was weird how the cupcakes looked really chocolatey and tasted more chocolatey but seemed to have so much more pistachio...I had to take a picture to show you what I mean. Not that this was a bad thing but I just thought it was interesting. Overall this wasn't my favorite cupcake of the bunch, but it was really a very good and interesting combination of flavors! Since Rebecca only works four days out of the week, Thursday was the end of National Cupcake Week 2010. Here are my overall rankings for the cupcakes of Ice Cream Dessert week! Office chatter would suggest Banana Split was number one for most people. I have to disagree. 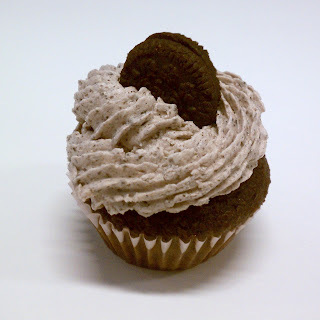 It was a close call between Turtle and Oreo, but because of the light and fluffy icing, Oreo got the top spot. I couldn't choose between Banana Split and Spumoni for 4th and 5th. I think the tarty fruit flavors put them at the back of the pack for me personally, but they were each yummy with interesting flavor combinations. At least two other coworkers gave the top spot to the Turtle Sundae. 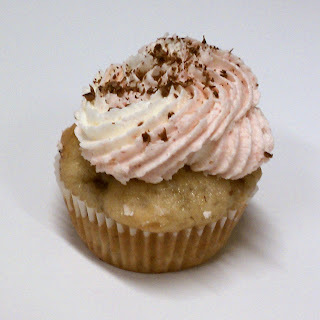 I should note that even though I reviewed and ranked the cupcakes, I really enjoyed every one of them! I want to thank Rebecca for making all those cupcakes, letting me blog my reviews, AND for having (and creating) National Cupcake Week in the first place! I can't wait to see what is in store for next year! If you tried them, which cupcake was your favorite? If you weren't as lucky as me...which do you think looks the best?